To save the owls, we are going to have to shoot a lot of owls. The San Jose Mercury-News reports wildlife biologists in Northern California are running an experiment to see if they can save the northern spotted owl by killing lots of barred owls, its main competitor for food and territory. The spotted owl is native to the Pacific Northwest, while the barred owl is an invader from the east. 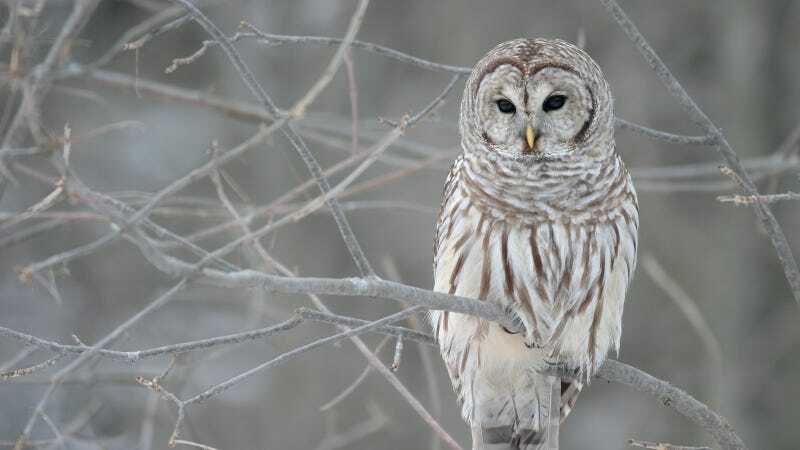 Learning from the mistakes of World War II, wildlife biologists are not going to allow the barred owl to run roughshod over the spotted owl's territory and are taking up arms in this fight. The Mercury News profiled Lowell Diller, a biologist for Green Diamond Resource Co., who by his own estimation has killed more than 100 barred owls and seemed haunted by his exploits in the owl wars. "By the time I'm done with this, I'm going to need a lot of therapy," Diller told the Mercury News. The northern spotted owl is an endangered species, and there is evidence linking the barred owls spread to the spotted owl's decline, although destruction of the forests where they live is obviously an issue as well. And the Mercury News reports a forthcoming study in the Journal of Wildlife Management and Wildlife Monograph shows that Diller's approach of shooting one owl to save another actually does work in helping spotted owl populations bounce back. Obviously, PETA isn't thrilled by this, telling the Mercury-News the approach is "cheap, dirty, destructive and unimaginative." The National Audubon Society's not crazy about it either, refusing to take a side for or against the shooting. It's time to take sides America. Take a stand now, before the Owl Wars show up on your doorstep.